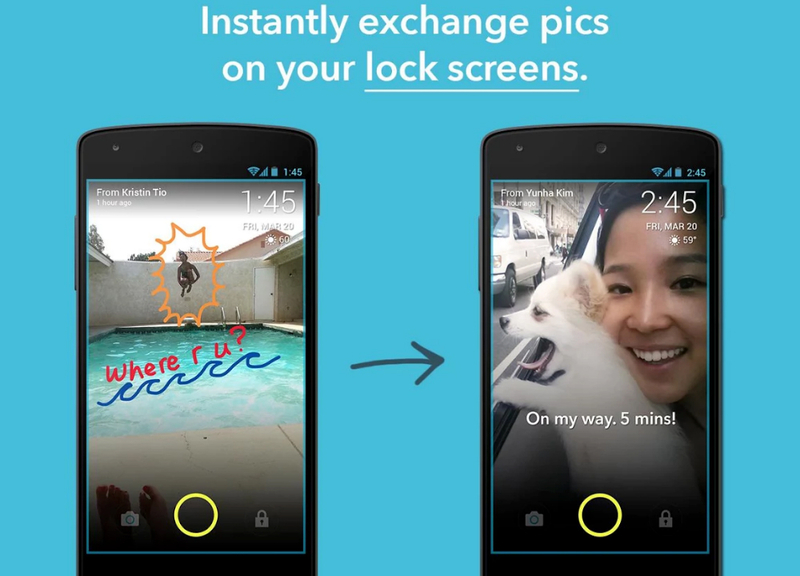 Say “hola” to ScreenPop Lockscreen Messenger, or just ScreenPop for short. This app’s intention is to make the taking and sharing of photos much quicker with your inner circle, simply by making it all take place from your lock screen. What is this witchcraft, you may ask? Think of it as you would Snapchat. While a few of you are very vocal on your discontent with Snapchat, you may be shocked to learn that millions of Snaps are likely sent every day, making it a real contender for the way people choose to communicate with their best friends. With ScreenPop, users are able to snap photos, draw quirky things on top, then ship them out for others to enjoy, all from the comfort of their phone’s lock screen. As shown in the example photos above, you can ask where someone is, then quickly receive a reply that features a cute dog. I won’t sit here and tell you this is better than a text message or IM or regular Snap, but to each their own. Keep in mind that any ounce of privacy you may typically expect when sending photos to and from your friends is essentially gone when using this app. The app is free to download on Google Play, so if you and your friends feel like going back and forth to try it out, be our guests.